Looking forward to the kick-off of our new project ‘IMAGINATION’ on the Urban Implications and Governance of CEE Migration in Europe. The kick-off will be held at Hotel New York, Rotterdam, 6-7 June 2013. Together with Dr. Arco Timmermans I’ll organize a panel at the NIG annual work conference. The conference will take place at the University of Twente, 28-29 November 2013. The panel focuses on ‘Understanding Policy Dynamics: a critical confrontation of theories of the policy process’. It invites papers (empirical as well as theoretical/conceptual) on various policy domains but focusing on policy dynamics. For a full text of the call for papers: link. The IMISCOE standing committee on the Multi-Level Governance of Migration and Integration organises a workshop at the 10th IMISCOE conference in Malmo, 26-27 August 2013. For a full text of the call, see link. The aspirant standing committee Research-Policy Dialogues on Migration and Integration in Europe will organise a workshop at the 10th IMISCOE conference in Malmo, Sweden, 26-27 August. The workshop will focus on ‘Deconstructing the migration crisis: towards reflexive research-policy dialogues’. It invites conceptual as well as empirical contributions, from academics as well as from policymakers. See for the full text: link. Paper accepted at JCPA on the Interplay of Knowledge Production and Migratory Policy Making in NL and Germany. The paper ‘The interplay of knowledge production and policymaking: A comparative analysis of research and policy-making on migrant integration in Germany and the Netherlands’ was accepted as part of a special issue (edited by Frans van Nispen and me) on ‘Policy analysis at times of crises’. It is due to appear somewhere next year. 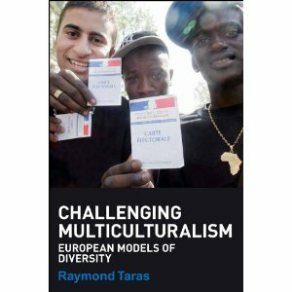 The book ‘Challenging Multiculturalism: Models of Diversity’ edited by Ray Taras is out now. I’ve written a chapter on ‘The Dutch Multicultural Myth’. On 29-30 November I will chair a session together with Dr. Sebastian Princen on‘Understanding policy dynamics: advances in theories of the policy process.‘ The panel is part of the annual conference of the Netherlands Institute of Government (NIG), this year to take place in Leuven/Louvain. You can find the panel programme through this link. Call for papers for seminar on ‘Theorizing the Local Turn in Immigrant Policies – a Multi-Level Approach.’ The seminar is a joint-initiative of the GRITIM-UPF – Interdisciplinary Research Group on Immigration of the University Pompeu Fabra, the Erasmus University of Rotterdam and the IMISCOE Network. It will take place on Friday 20th September, 2013, at Universitat Pompeu Fabra (Barcelona). Please find more information on the seminar and on how to submit papers, through the following Link. 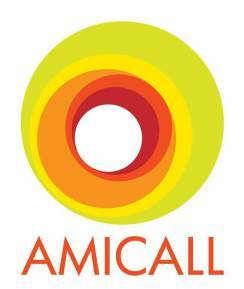 The final reports of the AMICALL project (Attitudes to Migrants, Communication and Local Leadership), funded by the European Integration Fund, are now online: click here. This includes the final transnational report as well as a Dutch language executive summary and the Dutch country context report. The project was coordinated by COMPAS in Oxford, the Erasmus University team was constituted by Prof.dr. Han Entzinger, Dr. Peter Scholten and Dr. Stijn Verbeek. 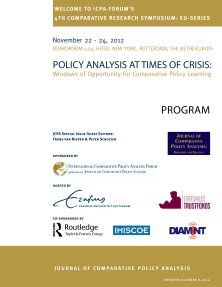 On 22-24 November, the 4th ICPA Comparative Research Symposium in Rotterdam on ‘Policy Analysis at Times of Crisis: Windows of Opportunity for Comparative Policy Learning.’ Together with dr. Frans van Nispen, I’ll be hosting the symposium, with key speakers like Frank Fischer, Iris Geva-May and Philippe Zittoun! For the full program, please click here. On 20-21 September, we will be hosting the mid-term meeting of the DIAMINT project on ‘Science-society dialogues on migrant integration in Europe’. Interesting review of my book ‘Framing immigrant integration’ in the Journal of the Royal Anthropological Institute, by Liza Mugge. See link. The launch of the new journal Comparative Migration Studies is approaching rapidly. Preparations for the first special issue, to be published in early 2013, are in full swing. 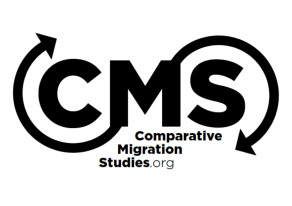 The website http://www.comparativemigrationstudies.org will be up and running soon. Tomorrow evening (28 August) a first meeting will be held with members of the advisory board. Also, we’ve just selected a logo for the new journal.